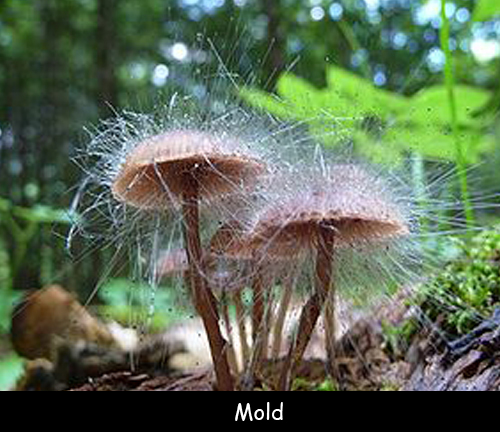 Mold can be described as a group of filamentous fungi that are very common on food or wet materials (in the UK and Ireland the spelling of mold is mould). It is linked to (CIRS) Chronic Inflammatory Response Syndrome. It is also responsible for important medications, including penicillin. This antibiotic was accidentally discovered by Alexander Fleming. The majority of mold that grow on damp building materials are found in the soil. They develop very quickly in the presence of the right conditions like moisture, suitable temperature and ample food, but remain hidden for a long time. There are more than 100,000 species of these microorganisms globally, most of which have not been classified. Mould can also cause skin rashes, birth defects, asthma, cancer and some other health problems. It also has a negative effect on population health and damage to the building. If a person is constantly exposed to mold, it can result in a condition called Hypersensitivity Pneumonitis. A constant exposure to mould of pregnant women can increase the chances of suffering a miscarriage. The mould Monascus purpureus is used to produce red rice yeast. It has shown to help reduce levels of bad cholesterol. It can eat a variety of things including wood, fabric, and sometimes even plastic and metal. Mold removal is the process of removing the growth from a building. The only way to get rid of it is to remove everything that has mould. There are several types of molds on the basis of their color but the color rarely tells anything useful about it. Declan, Tobin. " Facts for Kids about Mold ." Easy Science for Kids, Apr 2019. Web. 18 Apr 2019. < https://easyscienceforkids.com/mold-facts/ >.